One of the biggest booms in the 1980s for geeks was the collectible toy market. Toy manufacturers over the years developed a large array of products including board games, imitation weapons and costumes for role-playing, and baby dolls. In 1959, Mattel would shake up the industry with the introduction of the Barbie doll leading to a new market for poseable figures with costumes. Such toys as Hasbro’s G.I. Joe line, Gilbert’s James Bond line, Mego’s various licensed products like those from DC and Marvel Comics, Star Trek, Edgar Rice Burroughs, Wizard of Oz, and the Planet of the Apes, AHI’s Official World Famous Super Monsters (based on the Universal Studios monsters), and Kenner’s Six Million Dollar Man line were just some of the figures to emulate Barbie’s appeal. Mego would later begin experimenting with smaller figures, like its Pocket Super Heroes and Micronauts (the latter actually Japanese toy company Takara’s Microman line licensed for America). 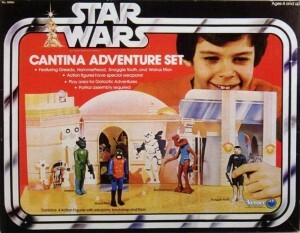 However, Kenner would strike gold in 1978 with Star Wars. Virtually no one predicted the impact Star Wars would have not only on the future of Hollywood, but also what it would do for merchandising. Mego certainly didn’t when they turned down the license for the film. Kenner also certainly didn’t know the hunger for anything Star Wars-related that would arise and under produced a toyline based on the film. This miscalculation on Kenner’s part largely created the concept of collectible toys as the limited run of first wave action figures and the now almost legendary “Early Bird Certificate Package” are wildly sought after then and today. 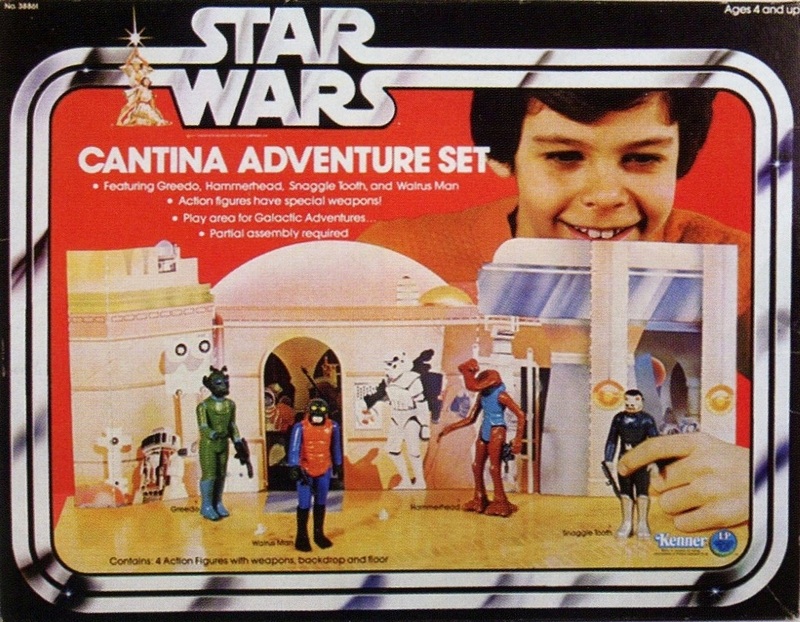 Further, the line helped popularize the concept of retailer exclusive products (notably the J.C. Penney Sonic Controlled Land Speeder and Sears Cantina Adventure Set). 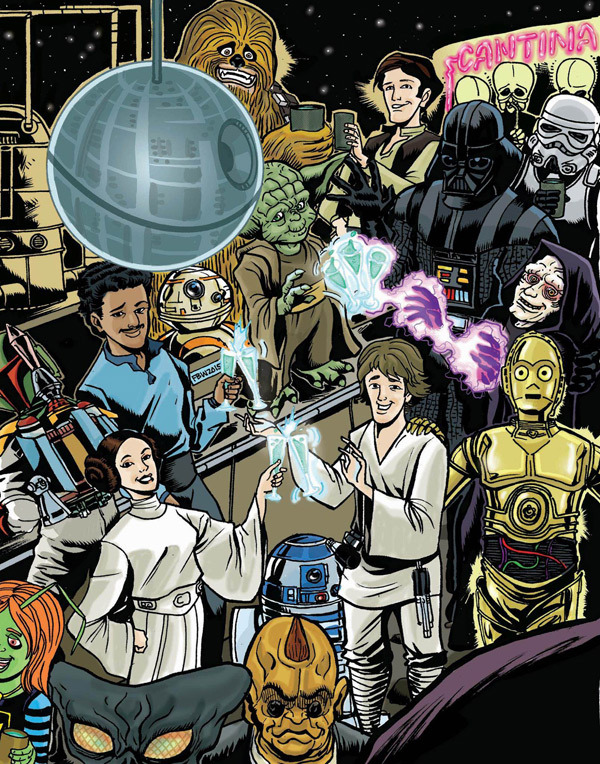 Star Wars and its accompanying Kenner toyline opened the floodgates for the possibilities in toy licensing and toys as collectibles. While the toy industry was trying to figure out the best way to take advantage of the growing action figure market, toys marketed for girls would also develop further along. In 1979, artist Lisa Frank would found a company named after her employing her colorful art featuring neon colored images of various cute animals with rainbows and symbols like hearts, stars, and musical notes. During the 1980s, the Lisa Frank brand exploded appearing notably on school supplies, posters, and toys and largely became a must-have set for many American girls. The year following Lisa Frank’s invasion into the lives of little girls, the world would meet Strawberry Shortcake. Conceived by greeting card company American Greetings and employed on their products, Strawberry Shortcake quickly migrated into a lucrative franchise that included dolls, merchandise, and animated television specials (not to mention an Atari video game). The success of the franchise prompted American Greetings to similarly develop other brands like the Get Along Gang, the Popples, and the juggernaut Care Bears franchise. Mattel, whose Barbie as already noted had changed the toy industry, expanded that brand in 1980 with Black Barbie beginning a trend of ethnically diverse toys. 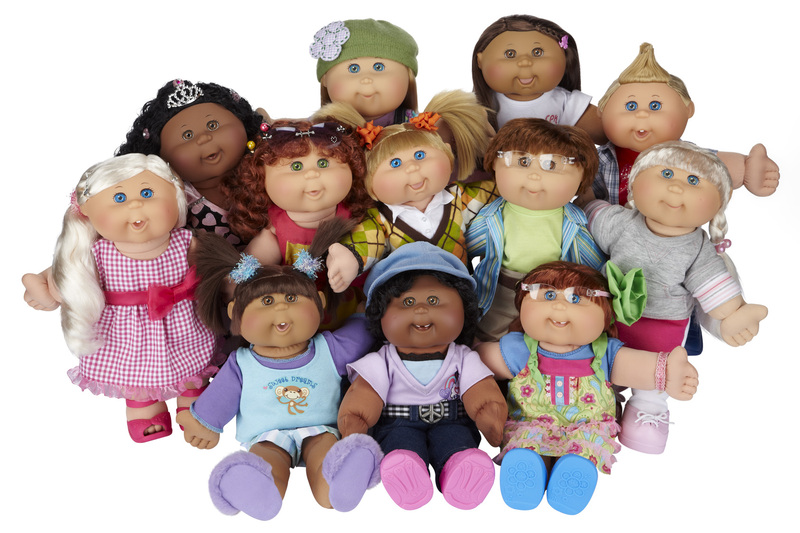 Coleco, a toy company known for developing video game hardware (like the Telstar, handheld electronic games, Mini-Arcade series, and the ColecoVision), licensed a line of dolls from Xavier Roberts that became one of the most collectible toylines of the 1980s in the Cabbage Patch Kids in 1982. A series of mystical baby dolls born in cabbage patches, the Kids would not only be sold in toy stores but the children who received them would adopt these babies to protect them from the evil Lavendar McDade who wanted to enslave the children. The series would transition into the animated television special Cabbage Patch Kids: First Christmas (and would be resurrected in 2005 in stop motion DVD specials). 1982 would be a great year for cuteness as the aforementioned Care Bears made their premier accompanied by animated specials before gaining their own television series and feature films (expanding later with the Care Bear Cousins, non-bear animals with tummy symbols). Games and puzzles would also see some advents in the 1980s. A puzzle that would capture the imagination of the American consciousness in 1980 was the Rubik’s Cube. A 3D puzzle developed by Ernő Rubik in 1974, Ideal Toy Corp would license and mass produce the Rubik’s Cube to international acclaim. 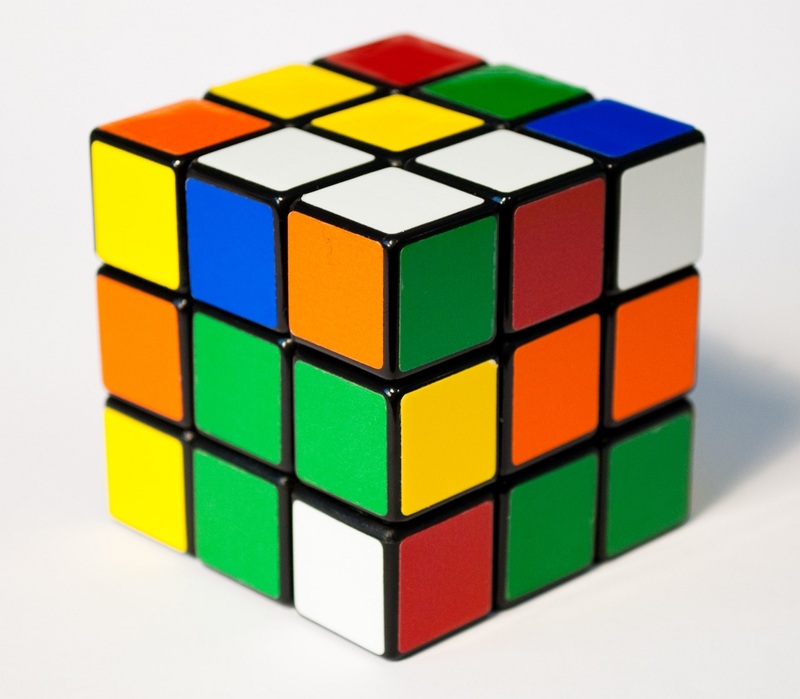 The six-sided brightly colored puzzle generated interest in similar puzzles and solving the Cube became a symbol of genius (even today it’s not uncommon in popular media for a character to demonstrate a high degree of brilliance by quickly solving the Cube). The popularity of the Rubik’s Cube was such that it even spawned an animated series in 1983 in Rubik, the Amazing Cube. The first American animated series to feature Latino main characters (conceived by the creators of Scooby-Doo), Rubik was a magical sentient Cube who would come to life whenever his puzzle was solved. On the game front, 1982 was the year Selchow and Righter licensed and produced the popular board game Trivial Pursuit for the United States. Relying on trivia knowledge in six fields of study, in 1984 Trivial Pursuit became a dominant game often employed in parties with up to six players or team play. In 1980, the second film in the Star Wars trilogy in The Empire Strikes Back hit theaters and Kenner was sure to produce a more robust line of toys to capitalize on the series’ success including its first mail-in promotion for the popular Boba Fett character. Hasbro would fire a huge salvo in the action figure arena with its property G.I. Joe in 1982. Re-branding the line as smaller figures (more in line with Star Wars’ scale), Hasbro entered into a partnership with Marvel Comics to produce the G.I. Joe: A Real American Hero line that used an animated television series and comic book series to promote their toys. New, original characters (with expansive back stories, especially in the comics) were introduced with ethnic/gender diversity wherein the series proved to be a major hit (such that the line thrives today reinforced by live action film adaptations). The one who largely guided the line at this time was Marvel editor Larry Hama whose military experience and martial arts training become critical in capturing these new characters, especially breakout stars in the ninjas Snake Eyes and Storm Shadow. The same year G.I. Joe made its way to store shelves, Mattel would introduce its own major action figure line of the decade. When Star Wars was rejected by Mego, toys for the film were shopped at various other manufacturers. When the line was brought to Mattel, it was decided the cost of the license exceeded expectations and was passed on with no one suspecting the impact the film and its merchandise would have. With the success of Kenner’s Star Wars line, Mattel sought something that could compete against the line it rejected. This in mind, Mattel lead designer Roger Sweet conceptualized a muscular figure using Mattel’s Big Jim action figure as a base and presented his creation as a barbarian, soldier, and spaceman. Executives liked the design of the barbarian best giving birth to He-Man and the Masters of the Universe. One part sword-and-sorcery to one part space-faring, advanced technology science fiction, Masters of the Universe (MOTU) would in time draw parallels to the like of Conan the Barbarian, John Carter, Captain Marvel, and Jack Kirby’s the New Gods. Mattel would have a certified hit on their hands competing against Hasbro’s G.I. Joe and Kenner’s Star Wars line (the final film in the original trilogy Return of the Jedi hitting theaters the following year). And just as G.I. 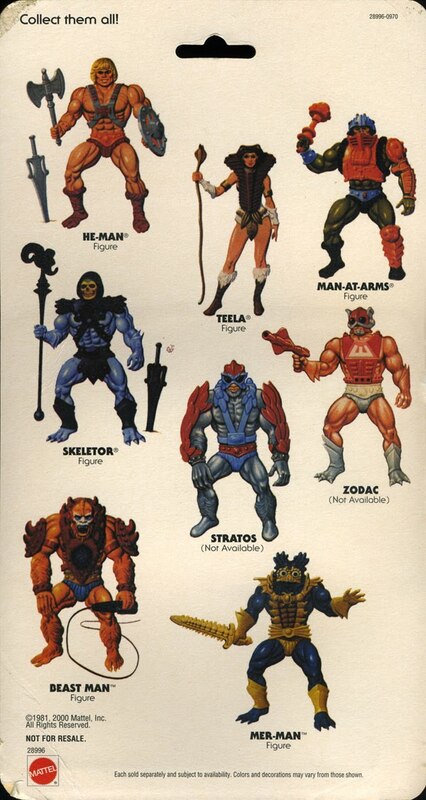 Joe came onto the scene with a cartoon and comic book adaptation, MOTU not only followed suit, it included mini-comics with its figures (briefly, Mattel licensed He-Man to DC Comics for them to adapt). Masters of the Universe remains strong today, though not as prominent as it was, with toys, comics, and a planned live action adaptation (Mattel having such a film produced in 1987 which was received poorly). While other toylines like TOMY’s Zoids and Hasbro’s Glo Worm and My Little Pony (whose “cutie mark” heralded back to the Care Bears’ tummy symbols) would have certain levels of success, the next big toyline came in 1984. Takara, the Japanese toy company who licensed its Microman series to Mego in the 1970s as Micronauts saw its American distributor go out of business. 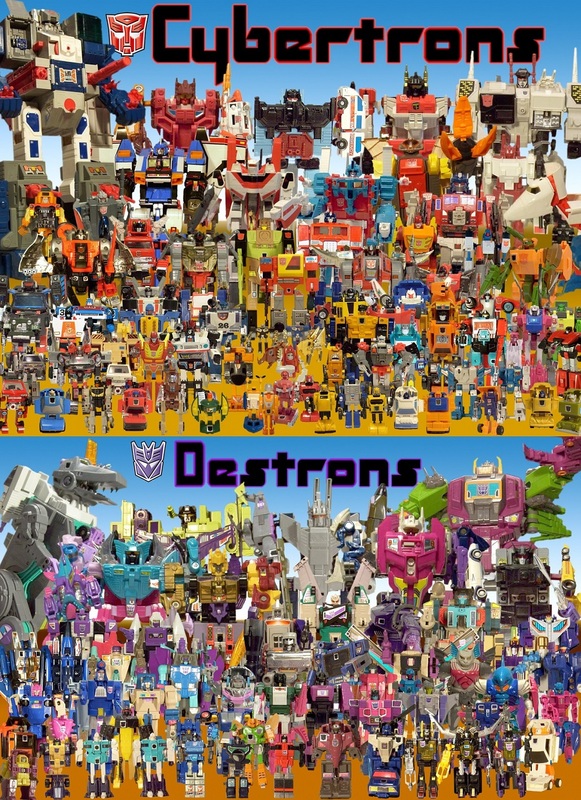 Coming to Hasbro, Takara wanted to break toys from its Diaclone and Microman Micro Change lines into the American market. Approaching Marvel just as Hasbro had with G.I. Joe, the partnership bore fruit in Transformers. Again producing animated and comic series with unique, interesting characters, Transformers would tell the story of giant transforming robots in a battle for supremacy over their homeworld that spills over onto Earth. 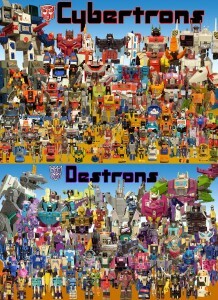 And again, Hasbro would have another hit rivaling G.I. Joe and again produced a property that thrives today. Even before Transformers found their way onto store shelves and airwaves, a competing transforming robot line would pop up to either attempt to surpass or equal Hasbro’s toys (though, ended up only riding the line’s popularity). Tonka, known for its truck and construction equipment toys, caught wind of the Takara/Hasbro deal and sought to make a similar deal with Takara’s Japanese competitor Popy (a subdivision of Bandai). Arriving a year before Transformers, GoBots (using toys from the Machine Robo line) found some small measure of success but whose inferior quality was accentuated by the arrival of Transformers (Hasbro would later acquire Tonka and the GoBots line, though original designs still belonged to Bandai). Hanna-Barbera would produce an animated series and feature film based on GoBots to help promote the toys. Popy also produced the toys of the two series that made up Voltron in America and Matchbox would import the toys for the animated series for the US. 1984 would prove to be a huge year for the toy market. 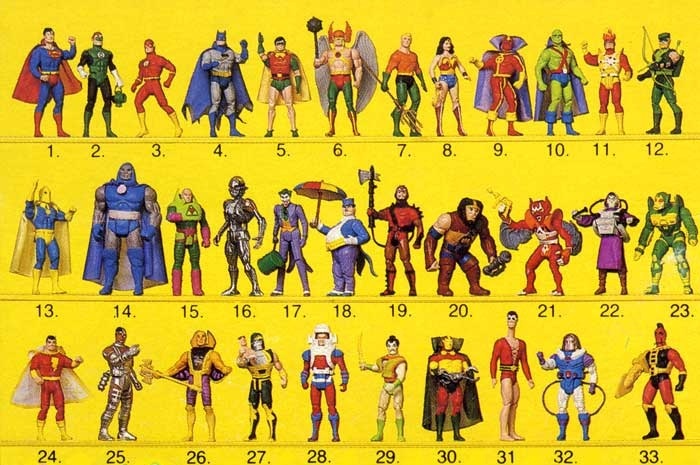 DC Comics was looking to take advantage of the booming toy industry and provided a license to Kenner to make toys based on their properties thanks to the toy company’s idea of having its figures perform mechanical actions. These actions would inspire the name of the toyline in Super Powers, so far as to say the actions were based on the character’s abilities and powers. 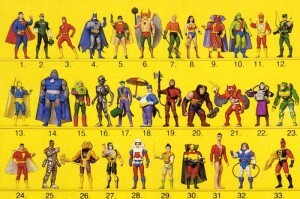 To help sell the line, DC Comics produced several comic series based on the toys (including mini-comics with most figures) and resurrected the Super Friends animated series at Hanna-Barbera. The toys and cartoons made ample use of the beautifully drawn DC Comics Style Guide maintained by artist José Luis García-López. The toys, designed with the highest quality, proved to be a hit. So beloved was the line that modern day sculptors Four Horsemen Studios would employ similar designs and sculpt Super Powers original characters for the DC Universe Classics toyline. Mattel would catch wind of the Kenner/DC deal and licensed properties from Marvel that same year. 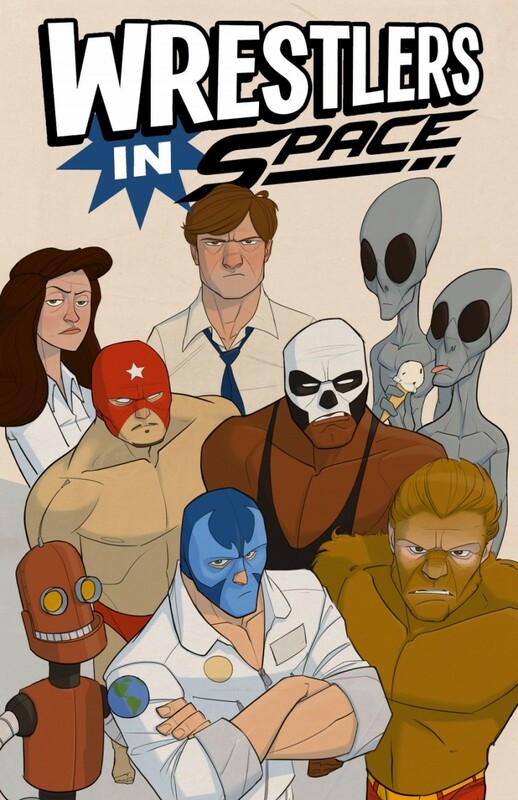 Secret Wars would be the name of a massive crossover event at the comic publisher and title of its toyline. However, the poor quality of the toys made the line largely forgettable with only two waves (a small third wave available in foreign markets). The year was rounded out by LJN’s popular Wrestling Superstars, Tonka’s Pound Puppies, and Kransco’s battery-powered ride-on toy cars Power Wheels. 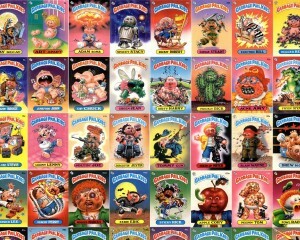 Trading card company Topps (primarily known as a sports card publisher) would decide to parody the immensely popular Cabbage Patch Kids in 1985 with the Garbage Pail Kids. 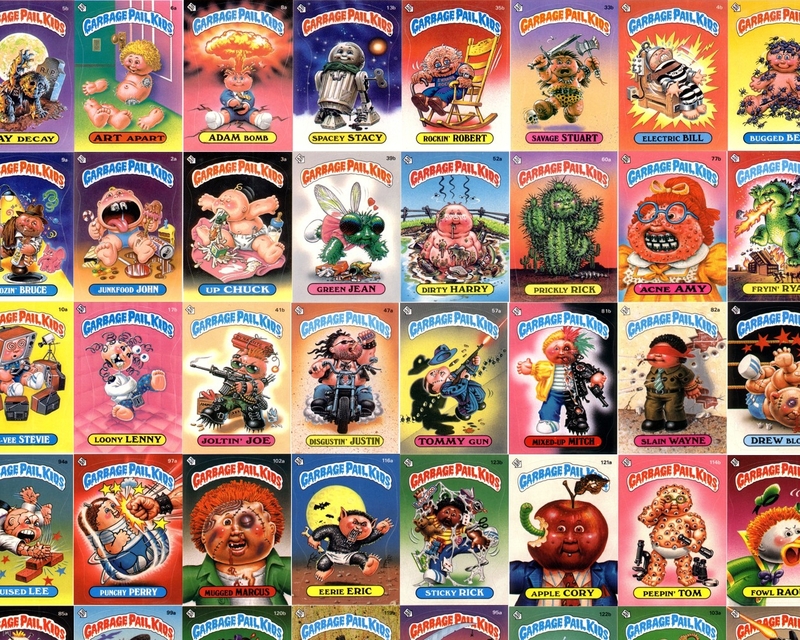 Like Mad magazine meets Tales from the Crypt, Garbage Pail Kids were often disgusting depictions of Cabbage Patch Kid-like characters using wordplay to name the characters after the vile images they were associated with. Future Pulitzer Prize-winning cartoonist Art Spiegelman (of Maus fame) conceived of the line while working on a similar product at Topps called Wacky Packages (which parodied consumer products) where it was decided to give the concept its own line. The card series proved to be extremely popular, so much so it spawned a live action film in 1987. The same year the trading card series premiered, talking teddy bear Teddy Ruxpin would premier on the market. Produced by Worlds of Wonder (WoW), Teddy would be loaded with a cassette tape in his back and would tell a story while moving his mouth and eyes imitating a living being. Sold separately, Teddy’s friend Grubby could be connected to Teddy via a cable where the two would speak to each other and Teddy would direct his story towards his friend. The speaking doll would be a hit and spawned an animated series based on the character in The Adventures of Teddy Ruxpin. The following year, WoW would introduce Lazer Tag, a popular game where players wore receivers and carried infrared light guns trying to eliminate each other by directing light blasts into the receivers enough times. Another popular toy, it would also spawn an animated series in Lazer Tag Academy. By 1985, cartoon and toyline evolved into the chicken or the egg argument of which came first, cartoons became extended commercials for toylines and the continuation of an animated series largely depended on the sales of its toys (a concept that continues to an extent today). Series like ThunderCats, Robotech, and M.A.S.K. were popular animated series with popular toylines (not to mention comic book adaptations). The success of ThunderCats led to the emergence of SilverHawks and TigerSharks. Robotech’s toyline from Matchbox did so well that despite being a mash-up of three largely unrelated preexisting series from Japan, the toy company ordered another series to sell more toys. Though, not all toys needed accompanying animated series. My Buddy, a child size doll from Hasbro meant to deliver a doll boys would want, had no such help (though, the similar My Pet Monster from American Greetings the following year chose to license an animated series). Also in 1985, Hasbro mass produced the Pogo Ball without trying to put it into a cartoon or book. Mattel would release the Japanese toy series Kinkeshi from Bandai in America as M.U.S.C.L.E. to some success. Miniature, flesh colored figures based on the manga series Kinnikuman (its sequel series known in America as Ultimate Muscle), the line included figures based on real world professional wrestlers like Terry Funk, Dusty Rhodes, Abdullah the Butcher, and Jushin “Thunder” Liger. In 1986, the market began to slow. While toys like Kenner’s Centurions, Galoob’s Micro Machines, and Mattel’s Popples made it to store shelves, the market became saturated with toy brands. Companies began focusing on the properties they had previously fostered in order to maintain sales (as some companies began to see losses producing toys children either didn’t want or parents couldn’t readily afford). In 1985 and 1986, several popular toylines would end up canceled with more to end in the years that followed. Even the popular Star Wars brand, which was supported by two separate animated series in Droids and Ewoks, saw significant decline. Toy companies began trying to develop toys that were either inexpensive or had some unique twist to them. For the former, American Greetings’ Madballs and Fisher-Price’s Smooshies fit the bill. For the latter, Mattel produced the line Captain Power and the Soldiers of the Future. A television series that blended live action science fiction with cutting edge computer generated animation, its toys would interact with the TV show and its video tapes. Sadly, as with many Sci-Fi series, the show proved too expensive to maintain (not to mention, many found the toys didn’t interact with the series as they were suppose to). By 1988 as the decade neared its end, Mattel would begin the tradition of Holiday Barbie and OddzOn Products produced the wildly popular Koosh Ball. Despite the bubble seemingly bursting on collectible toys, Playmates Toys struck gold with its license of the Teenage Mutant Ninja Turtles comic book and animated series (later expanded with live action films). 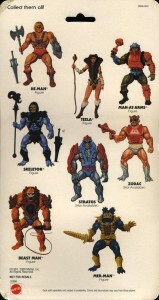 The toyline demonstrated that despite the shrinking market, a hunger still existed for unique, well crafted toys. The decade would finish out with the introduction of Precious Moments, originally a series of greeting cards featuring illustrations of cute little children and angels that expanded into an empire with the wholesome images showing up across various platforms, most notably as porcelain figurines. In Part Four of “The ’80s – Geek Edition,” we’ll examine some pop culture and fantasy of the 1980s.